Here it is, The "Cove 2000 Rapala" pg. I have several Items that I'm looking at. I hope to be able to add these to my collection. There are still a couple of Items that I'm looking for, So if you have something that you might think I'm Interested In, Take a look at my "Want's" Pg. Well, back to this page. I hope to add soon some of the new Items. Some of what you've already seen on other pages and a couple of Rapala-Normark Items that, well are a little odd. As always, collect what you like and enjoy what you collect. Normark cross country ski's. View Here. Here it is, The first new item to add to my collection. 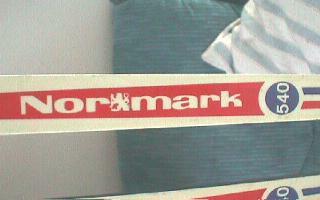 A pair of Normark 540 Cross Country Ski's. I just purchased them and hope to very soon have them in my hands. I will when I get them, try to add what Info I can. At first I thought that these were not what I was looking for. After a closer look and the fact that they have the Rapala-Normark Lion seal on them gave me a little more assurance as to the originality of them. Another strange and odd item to add to the collection. Another nice Rapala lure. A floater that has both the lip and belly mark in black print. It also has the box and paper insert. I'll add more info and scans as soon as lure arrives. This listing is for a pair of lures. Both are in the box and have the paper insert. These lure are in great condintion and have the lip and belly mark. again, I'll add more info when these arrive. I will update this info and add a couple of scans of these Items when I get them. This purchase also includes 2 balanced jigging lures which I will also update. 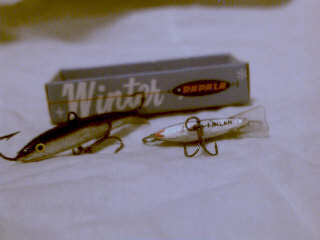 New "Reproduction" Original Rapala wobblers. When I saw these I knew I had to add them, in fact I went as far to get 2 of these Items. It includes 2 lure's (floaters) in 2 different color patterns (Silver & Gold) in a older style box. What really caught my interest was the engraved wooden slide top box. I will add more info (what papers this Item comes with) and a few different scans of this Item. The next 2 scans show a Rapala 25th year edition lure. Both sides. A Shad Rap, marked the same on both sides. The 2 scans show a Rapala Sliver series. This lure I got is with out the box. I went after this lure because of the color pattern. I am waiting to get 2 more lures like this in the box's. I will update this listing with the color code as soon as I get the information. The newest addition to the Rapala line of lure's. It's called a Team Esko. This model is mint in the box. It's like a floater, but with what looks like a shallow shad rap bill. The lip doesn't show up in the scan. I hope to add another view at a later time. A brand new, mint. Team Esko in Hot Tiger. I like this lure so well that I got several of them. What another color pattern! This Team Esko is in the Gold Rainbow Trout pattern. The next scan will show it out of the box to let you see the design of the lip. I also got a few of this color pattern too. *note. The GRT and HT Team Esko's were added to my collection on May 12th. Make a note on that Date. On June 1st I'm sure will see these lures in your favorite Tackle shop. Here is a group of the Original Fat Raps. Several color patterns shown, both size's. Take a look at the perch pattern lure's. I have one in both patterns. The gold tone belly and the orange tone belly. I had been watching the auction scene and it seemed that there wasn't much happening when these came along. I was able to get 2 of these lure's. Both are mint in the box. The color pattern is what first attracted me to them. I have come to find out, that the BTS stands for Bright Silver. Another odd colored Rapala Sliver. I have 1 without the box and 2 that are mint in the box. The MP is for Multi Pearl. It's a multi-colored on pearl pattern.